How He Used the Messiah Craze to Regain His Prestige—The Last Fight. ST. PAUL, MINN., Dec. 16.—When Sitting Bull surrendered to the United States authorities in the spring of '81, he was at first placed in the prison at Fort Randall, S. D., but later transferred to the Standing Rock Agency. The old man felt the loss of his power keenly, and sought some means to retain at least a part of his lost prestige. Pretending that he desired to secure a farm and settle down like a white man, he was given a location on the beautiful Grand river at a point 43 miles southwest of the Standing Rock Agency, which was located at a point half way between the Grand and Cannon Fall rivers, on the Missouri. At the home of Sitting Bull gathered a few who still acknowledged that he was a chief, and he longed for the time when he could again count over the large number of his followers. During the time he was away from the agency, Gall, John Grass and other noted chiefs secured again their former positions as leaders, and on Bull's return they were in a position to interfere with his ambition and they thwarted his every move toward hostility to the government, their influence with the Indians being so much greater than his that they prevented much trouble that had been planned by the old rascal. The first report of the coming of the Indian Messiah was hailed by Sitting Bull as the longed-for opportunity, and he tried his best to take advantage of it. Naturally superstitious, the Indians were ready for such an outpouring of their pent-up feelings in form of a religious dance. Bull had always gained his greatest success from his stability as a medicine man or diplomat, and he felt that the time for him to get his revenge on the other chiefs and on the government had arrived. He at the start joined in with the ghost-dancers, not shouting and dancing so much as inciting the others to the greater activity in that line. When the Indians would go dancing around in a circle and they fell to the ground from dizziness and exhaustion the wily old chief would take his place alongside of the fallen one, and after a few words with him would announce what visions of the Messiah and the coming again of the hunting grounds of the past had been witnessed, and the dance would be resumed with renewed vigor. Soon another would fall in a faint and the same programme would be gone through with. By carefully nursing this budding religious belief Bull was fast regaining his old prestige, and it was but natural that the government would at the first announcement of his connection with the troubles seek to effect his capture. 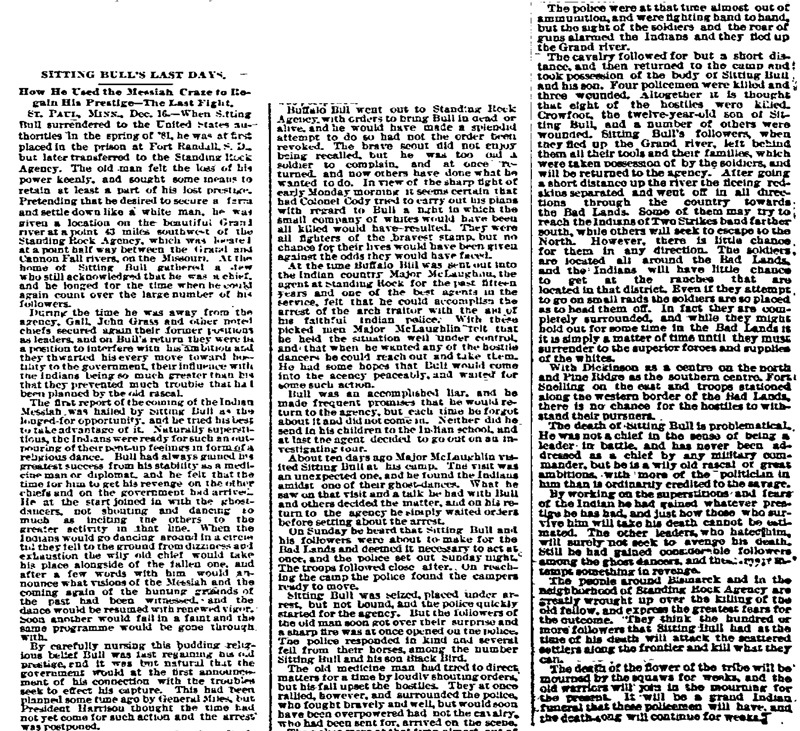 This had been planned some time ago by General Miles, but President Harrison thought the time had not yet come for such action and the arrest was postponed. Buffalo Bill went out to Standing Rock Agency with orders to bring Bull in dead or alive, and he would have made a splendid attempt to do so had not the order been revoked. The brave scout did not enjoy being recalled, but he was too good a soldier to complain, and at once returned and now others have done what he wanted to do. In view of the sharp fight of early Monday morning it seems certain that had Colonel Cody tried to carry out his plans with regard to Bull a fight in which the small company of whites would have been all killed would have resulted. They were all fighters of the bravest stamp, but no chance for their lives would have been given against the odds they would have faced. At the time Buffalo Bill was sent out into the Indian country Major McLaughlin, the agent at Standing Rock for the past fifteen years and one of the best agents in the service, felt that he could accomplish the arrest of the arch traitor with the aid of his faithful Indian police. With these picked men Major McLaughlin felt that he held the situation well under control, and that when he wanted any of the hostile dancers he could reach out and take them. He had some hopes that Bull would come into the agency peaceably, and waited for some such action. Bull was an accomplished liar, and he made frequent promises that he would return to the agency, but each time he forgot about it and did not come in. Neither did he send in his children to the Indian school, and at last the agent decided to go out on an investigating tour. About ten days ago Major McLaughlin visited Sitting Bull at his camp. The visit was an unexpected one, and he found the Indians amidst one of their ghost-dances. What he saw on that visit and a talk he had with Bull and others decided the matter, and on his return to the agency he simply waited orders before setting about the arrest. 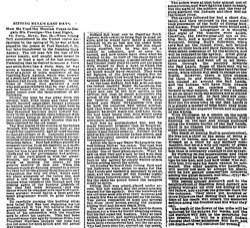 On Sunday he heard that Sitting Bull and his followers were about to make for the Bad Lands and deemed it necessary to act at once, and the police set out Sunday night. The troops followed close after. On reaching the camp the police found the campers ready to move. Sitting Bull was seized, placed under arrest, but not bound, and the police quickly started for the agency. But the followers of the old man soon got over their surprise and a sharp fire was at once opened on the police. The police responded in kind and several fell from their horses, among the number Sitting Bull and his son Black Bird. The old medicine man had tried to direct matters for a time by loudly shouting orders, but his fall upset the hostiles. They at once rallied, however, and surrounded the police, who fought bravely and well, but would soon have been overpowered had not the cavalry, who had been sent for, arrived on the scene. The police were at that time almost out of ammunition, and were fighting hand to hand, but the sight of the soldiers and the roar of the guns alarmed the Indians and they fled up the Grand river. The cavalry followed for but a short distance, and then returned to the camp and took possession of the body of Sitting Bull and his son. Four policemen were killed and three wounded. Altogether it is thought that eight of the hostiles were killed. Crowfoot, the twelve-year-old son of Sitting Bull, and a number of others were wounded. Sitting Bull's followers, when they fled up the Grand river, left behind them all their tools and their families, which were taken possession of by the soldiers, and will be returned to the agency. After going a short distance up the river the fleeing redskins separated and went off in all directions through the country towards the Bad Lands. Some of them may try to reach the Indians of Two Strikes band farther south, while others will seek to escape to the North. However, there is little chance for them in any direction. The soldiers are located all around the Bad Lands, and the Indians will have little chance to get at the ranches that are located in that district. Even if they attempt to go on small raids the soldiers are so placed as to head them off. In fact they are completely surrounded, and while they might hold out for some time in the Bad Lands it is simply a matter of time until they must surrender to the superior forces and supplies of the whites. With Dickinson as a centre on the north and Pine Ridge as the southern centre, Fort Snelling on the east and troops stationed along the western border of the Bad Lands, there is no chance for the hostiles to withstand their pursuers. The death of Sitting Bull is problematical. He was not a chief in the sense of being a leader in battle, and has never been addressed as a chief by any military commander, but he is a wily old rascal of great ambitions, with more of the politician in him than is ordinarily credited to the savage. By working on the superstitions and fears of the Indian he had gained whatever prestige he has had, and just how those who survive him will take his death cannot be estimated. The other leaders, who hated him, will surely not seek to avenge his death. Still he had gained considerable followers among the ghost dancers, and th[unreadable]tempt something in revenge. The people around Bismarck and in the neighborhood of Standing Rock Agency are greatly wrought up over the killing of the old fellow, and express the greatest fears for the outcome. They think the hundred or more followers that Sitting Bull had at the time of his death will attack the scattered settlers along the frontier and kill what they can. The death of the flower of the tribe will be mourned by the squaws for weeks, and the old warriors will join in the mourning for the present. It will be a grand Indian funeral that these policemen will have, and the death-song will continue for weeks.